Your doors are exposed to the elements every day, along with experiencing a lot of foot traffic and use. It’s no wonder that these can get dirty, worn down, or even damaged. If you’ve been using the same patio door for years, it’s probably time for a replacement. 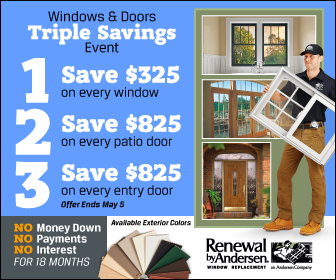 Renewal by Andersen® of St. Louis installs new patio doors that are durable, easy to maintain and use, and long lasting. The reason for the durability of our patio doors in St. Louis lies in their material, Fibrex®. This exclusive material combines the strength and insulation of wood with the low maintenance of vinyl. It will not rot, chip, corrode, rust, blister, peel, or crack. Its colors are baked in and it resists fading, so you don’t need to worry about repainting. Our Fibrex doors also stay rigid and stable in all temperatures, resisting thermal expansion. This reduces the risk of air leaks forming. Another great feature of our doors is our High-Performance™ Low-E4® glass. Aside from being more energy-efficient compared with regular dual-pane glass, it is much easier to clean because if their metal oxide coatings. These reduce water spots by up to 99% when activated by sunlight. Additionally, our door parts are designed for maximum convenience. Our sliding doors glide on two adjustable self-lubricating t andem rollers and feature an easy to maintain track . Our traditional French doors, on the other h and, have mortise- and-tenon joints that improve door performance and durability. Our Our patio and entry doors in St. Louis, MO, are designed to enhance your home without causing any stress or frustration. These are easy to clean, tough, and reliable. In addition, our start-to-finish process assures you that our door replacement process is enjoyable and hassle-free. Our expert installation team will install your new door on time, and on budget. For your peace of mind, we back our doors with an industry leading warranty, as well. Give us a call to learn more about our doors, or to schedule a free in-home consultation.